Steel Plinth™ infill boards sit neatly under your GramLine® fence providing a neat clean finish that prevents weeds or unwanted debris from entering your yard. Introduced by GramLine® in 2004, Steel Plinth™ fills in those unsightly gaps. Manufactured by GramLine® using Quality Tested and Certified Prepainted Hi-Tensile ColorSealed® coated steel. Look for the Steel Plinth™ brand for your assurance of quality. Patented in Australia and across the world – examples include patents AU2004291566 and US10/580348. Steel Plinth™ slows down weeds, prevents, rubbish dirt, grass and even snakes from entering your backyard or property from under the steel privacy fence. The Steel Plinth™ fits under the bottom SlimLine™ rail and inside the SmartPost® and SlimLine™ channel posts of your GramLine® steel privacy fence. Why have timber sleepers or toxic copper-chrome-arsenate treated timber logs when you can have a Steel Plinth™ that finishes and matches your steel privacy fence superbly. 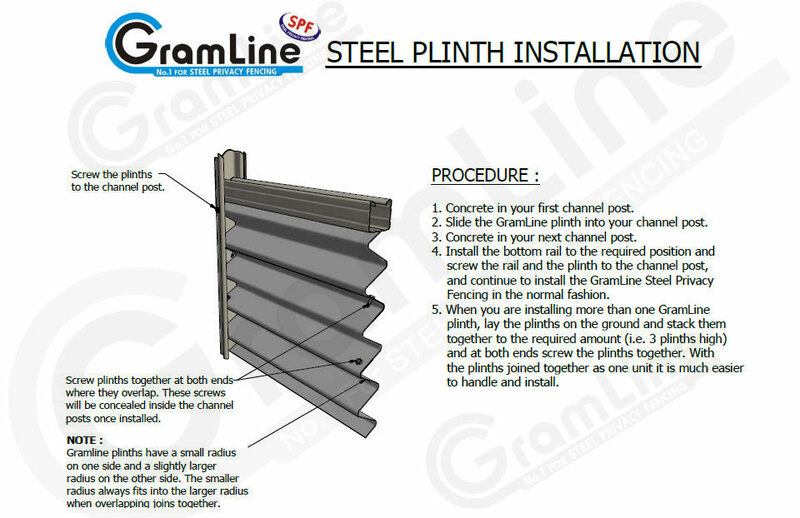 GramLine® Steel Plinth™ Retaining Walls should be back filled with blue metal to create good water drainage.